Unique Moments Photography from Gig Harbor Wa was privileged to be part of Julie and Darren’s beautiful wedding at the Kitsap memorial State Park in Poulsbo Wa. This was our 3rd wedding at Kitsap memorial park. It is very unique and ideal for families who want to bring in their own catering and have a nice relaxed wedding on the water in Poulsbo. The area where the wedding ceremony takes place is well isolated from the rest of the park and it has easy access to the water for pictures at sunset. The grounds have nice forest type backgrounds for photos and the hall where the receptions take place is easily decorated to make it your own and create a room that families will love. The park has no place for brides and bridesmaids to get ready and to change into a wedding formal attire. So its probably best to get dressed at a nearby motel and arrive at the park ready to go. However, you can get creative with this concern. Julie had a friend bring in a trailer that was designed and dressed up as a portable bridal dressing room. It was a little tight but got the job done for all the girls to change into their formal attire. Pictures turned out very cute. Julie and Darren had a first look before the ceremony started and she also had a planned first look with her father. Lots of tears and great moments for dad and the groom. Julies father was also the officiant for the ceremony. Formal pictures with the bridal party took place before the ceremony. The area alongside the reception hall has a nice covered area for an outdoor ceremony to take place and guests will love it because they have a great view of the sound while the ceremony is happening. Please note that if you have an afternoon ceremony guest will be facing directly into the sun and photographers will be trying to capture images shooting direct into late afternoon sun. However, use of a flash will help a ton to get nice images. Have your guests bring their sunglasses as they will need them. Julies father officiated the ceremony and he did a wonderful job. The ceremony was simply beautiful. After a kiss for luck , these two were ready to party the night away. The receptions highlights included speeches, a mom/son and father/daughter dance and the bride and grooms first dance as husband and wife. Cake cutting and lots of hugs and dancing with family and friend made the reception a total blast for everyone. We closed the night with a great sunset on the water. This was a great wedding. 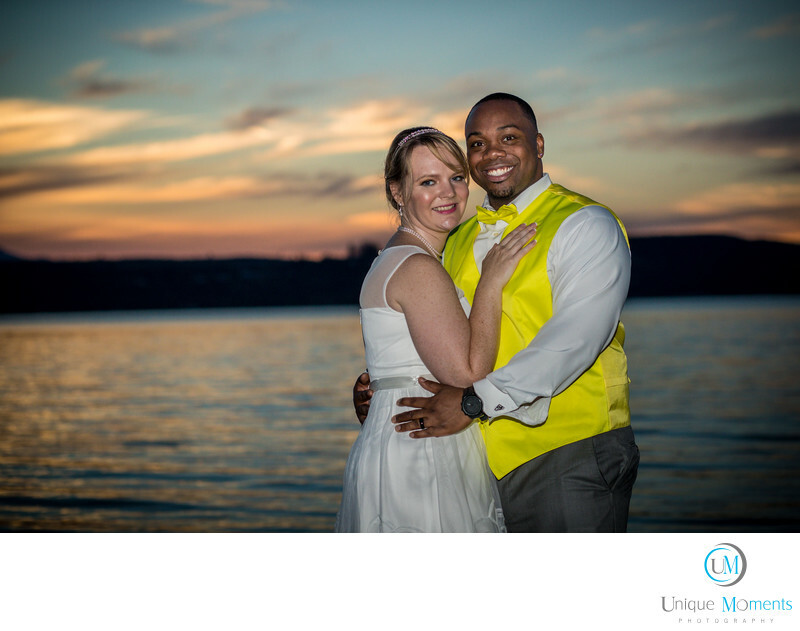 Kitsap memorial state park is a low key family type setting and its a great way for families to have a wonderful wedding with out a ton of costs. We have a great time every time we go to the park. You must contact the rangers station to book your dates. Location: 202 NE Park St, Poulsbo, WA 98370.